Eric Rush is one of the greats of New Zealand rugby. He started his career as an aggressive and speedy flanker with Auckland before transferring to North Harbour where he moved to the back line. 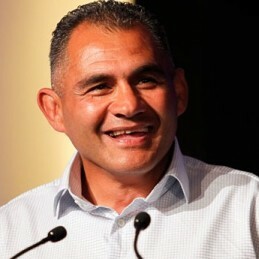 Between 1992 and 1996, Eric played 29 games for the All Blacks, including 9 Test matches. All up, he played over 200 first class games and scored over 100 tries. Eric excelled at Rugby Sevens, representing New Zealand for 17 years and captaining them to: a Gold Medal at the 1998 Kuala Lumpur Commonwealth Games, the World Sevens title for six years consecutively, the Sevens World Cup championship in 2001 and the Gold Medal at the 2002 Manchester Commonwealth Games. Eric was somewhat of a sporting all-star. He represented New Zealand in touch rugby and volleyball at under 17 level and won a light heavyweight boxing title as a schoolboy. Although a highly decorated sportsman, Eric found time to attain a Bachelor of Law and as a barrister has eight years’ experience in corporate law.